In a unique initiative, the Narayana Nethralaya, the city’s premier eye care institution, in association with the Saturday Party Sunday Society, screened over 1010 slum children as part of its Slum 10K, a project to provide free pediatric eye care to slum children, in Bangalore on March 8, 2009. 200 children were detected to have visual problems and some of the conditions detected were corneal problems (18), squint (11), retinal (09), eye lid problems (16) and cataract (03). All these children requiring surgery & treatment will receive the same FREE of cost at Narayana Nethralaya over 143 received spectacles and other treatment free of cost. 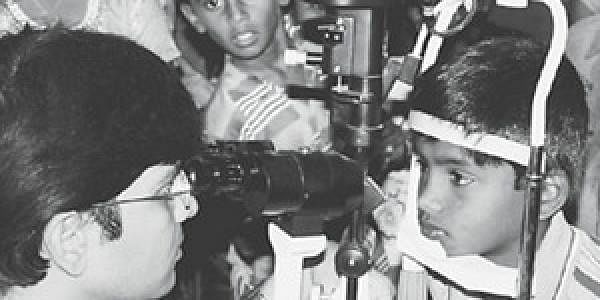 10K is a pediatric eye care initiative launched by Narayana Nethralaya in collaboration with Aruna Chetana and Seva Bharathi, that has set for itself a target of screening 10,000 slum children before the year ends. In the last two camps, a team of doctors, paramedical workers and volunteers from NGOs examined and treated over 2400 children and even operated those requiring surgery – free of cost. The SPSS members now find themselves in the middle of this unique social service event.